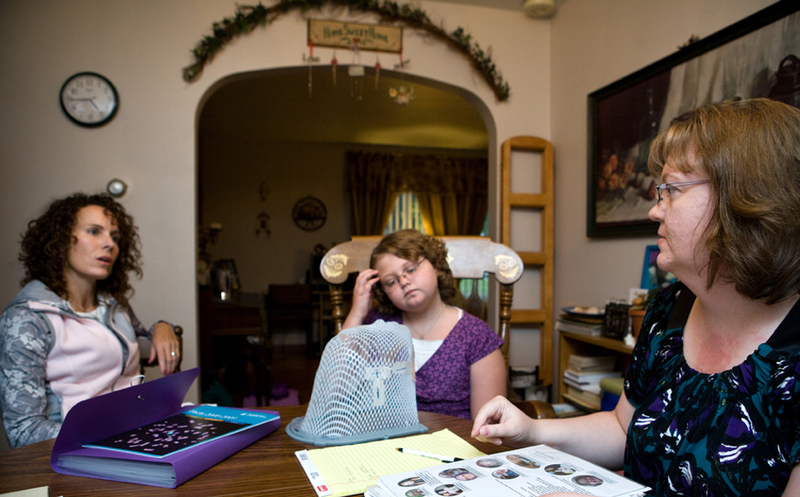 Ali Borgen, center, looks at a radiation mask that she wore during her treatments for cancer while her mom, Karen Borgen, right, and Kristen Abner compare notes on a possible cancer cluster in the area. Grand Forks Herald photo by Eric Hylden. A woman who has made awareness of childhood leukemia her life’s passion wants state and national health authorities to investigate a possible “cancer cluster” in Grand Forks County. Kristen Abner has identified at least nine cases of children diagnosed in the past three years with leukemia, including seven in the city of Grand Forks. Two of the children have died, while the rest are in treatment or in remission. Asked about the numbers, state health officials told the Herald on Thursday that they are still collecting data from 2007. A recent review of available data from 1997 to 2006 did not suggest anything out of the ordinary, but data for the past three years will be examined. “It takes a while to consolidate the data, and we’ll need permission (from parents) to get records so we can go back and track everything,” said Marlys Knell, program director of the North Dakota Cancer Registry. “Maybe there is something out there,” she said. The 10-year review was done after another Grand Forks resident — Karen Borgen, mother of leukemia survivor Ali Borgen, 13 — asked for help in getting a governor’s proclamation issued declaring September to be childhood cancer awareness month. Knell said the Grand Forks situation isn’t the first time someone has suggested the possibility of a cancer cluster in the state. Don Shields, public health director for Grand Forks, said that he routinely asks state health officials about unusual statistical trends they may have seen for the county, and there has been no concern expressed about unusual childhood leukemia numbers. “This has not come up,” he said Friday. “I do appreciate citizens who may be aware of something to raise that concern,” Shields said. “It’s very difficult, though, without looking at the specific types of leukemia, where the children live and what they may have been exposed to, to know whether a cluster truly exists in a city, a block, a county. There are so many variables. After hearing last week about Abner’s concerns, Shields contacted Kirby Kruger, the state epidemiologist, and Dr. Stephen Pickard, the state medical officer. “I asked them to take a look at this. It’s going to take some time to look at the data and all the variables, but I would suspect in the next 60 days we should have some preliminary answers. Abner was making small talk with a hair stylist early last year when she mentioned her plans to run a marathon. She was running, she said, to raise money for the Leukemia and Lymphoma Society. She explained that she had moved with her family to Grand Forks in July 2007 from Arizona, where she “adopted” childhood leukemia as a personal cause after a possible cancer cluster — an abnormally high number of cases diagnosed within a certain time and area — was identified in a town 30 miles from her home. The stylist, startled, told Abner that a friend had just lost a child to leukemia. By the time Abner ran that fall, she had learned the names of three more local children fighting leukemia. Using the Internet and talking with others in the community, she found five more. “From just my research, I know of nine cases in three years,” Abner said. “I am sure there are more out there. “Each one of these cases is a person, a child and a family suffering through immense physical and emotional pain, and I think the community needs to hear about it and learn more about the disease. Abner is intense in her advocacy. In addition to running marathons in the name of children taken by leukemia, she has held fundraisers. Six of the nine families, including parents of the two who have died, came to one two weeks ago at a local restaurant. For them, it seemed a break from the oppressiveness of the disease and a chance to compare notes with others who know what they know, fear what they fear. Abner and husband Greg, who also plans to run in an upcoming marathon, are part of a “virtual team in training,” with team members scattered about the country. It’s a fundraising technique developed by the Leukemia and Lymphoma Society. They have two healthy children, ages 4½ and 6½. 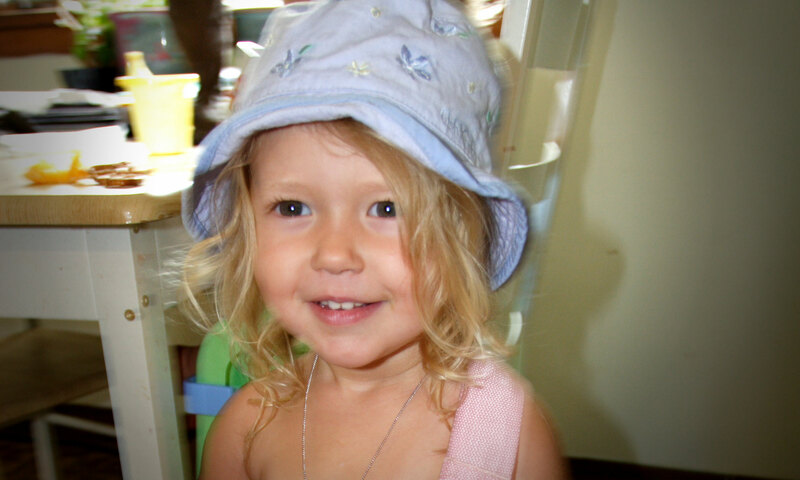 The little girl in whose name Kristen Abner ran in 2008 was Josie Greenwood. She became ill early in 2007, and that March doctors diagnosed acute lymphocytic leukemia. Just weeks later, on April 9, Josie died. She was 3. “The doctor told us right away, ‘There’s no way to know what caused this, so don’t drive yourself crazy,’ ” said her father, Joe Greenwood. “But we have other children who are living in the same environment. I have a daughter 1½ years younger than Josie who grew up in the same house. I want to see her grow past Josie’s age so I can believe she’s clear. While Josie was hospitalized, her father learned of two other Grand Forks children who were in the hospital, diagnosed with leukemia. “What’s the deal?” he remembers wondering. He said he appreciates and is comfortable with Abner’s driven concern — she herself calls it an obsession — with childhood cancer. “She seems capable, organized, and she clearly cares,” he said. “And cases are popping up here, so I’ve wondered” about numbers and possible causes. Ann Vossekuil’s daughter Taylor, 15, died Nov. 24, 2007, eight months and three weeks after her leukemia was diagnosed. Greenwood works at the Grand Forks Herald. So does Ann Bailey, of Larimore, whose daughter Ellen Gregoire’s leukemia was diagnosed June 3, 2008. “I respect what she’s doing,” Bailey said of Abner’s work, “and if someone could identify a cause, that would be wonderful. Abner concedes that in many cases, maybe most, “you can never find out 100 percent certain” what may have triggered a cancer. “But if we’re aware of high (levels of toxins or contaminants) in the soil or in the water, maybe there are things we can do. Ellen is 1½ years into a 2½-year treatment. What does it mean to care for a child with leukemia? What does it mean to be that child? Since Ali Borgen’s high-risk acute lymphoblastic leukemia was diagnosed on March 16, 2007, she has suffered multiple compression fractures of her vertebrae requiring her to wear a “turtle brace” for 13 months. For six months, she used a wheelchair or walker. Ali endured five bone marrow biopsies, 23 lumbar punctures, eight cranial radiation treatments, 638 days of chemo, more than 9,500 pills, 72 days in hospital, 129 visits to clinics, 13 to emergency rooms, and the loss of her hair (she had been growing it to donate to Locks of Love) three times in 15 months. She has had four strokes. Ali, who is learning to play the clarinet, claims lime green and purple as her favorite colors and cites a phrase from the Psalms, “… for I am with you,” as a favorite verse. She has had 19 X-rays, six CT-scans and four MRIs. She has made 20 visits to a psychologist and 34 to physical therapy. She missed 60 days of fourth grade, 98 days of fifth and 62 days of sixth. But on July 13, “I received my last chemo ever!” she said, and last month she marched off to seventh grade. The fight has been tough on her family, financially and emotionally, but Karen Borgen is quick to acknowledge the struggles other families have gone though, the generosity of friends and others, and the dedication of doctors, nurses and cancer organizations. “Ali and I have gone to Bismarck” to lobby legislators, she said, and Ali led the Grand Forks City Council in the Pledge of Allegiance at the meeting last month when Mayor Mike Brown declared September to be childhood leukemia awareness month in the city. She wonders about aerial crop spraying that was done next to a farmhouse where the family lived when Ali was a few months old, or the house that had water and mold damage when they lived there in 2001. “I would like to see child cancer receive as much money for research as adult cancers do,” she said. “More information should be available sooner, and people need to pay attention to the numbers. The Centers for Disease Control and Prevention defines a cluster investigation as “a review of an unusual number, real or perceived, of health events (for example, reports of cancer) grouped together in time and location.” If possible, the investigation looks for causes. Some causal relationships, such as the link between smoking and lung cancer, have been well established. But while air, soil and water quality remain sources of great public concern, “few community-level environmental exposures have been well studied,” according to the CDC’s National Environmental Public Health Tracking Network. It was the discovery of an unusually high number of cases of a rare type of pneumonia among homosexual men in the early 1980s that led eventually to identification of the human immunodeficiency virus (HIV) and acquired immunodeficiency syndrome (AIDS). Cancer, the uncontrolled growth and spread of abnormal cells anywhere in the body, is an umbrella term for many different but related diseases, each with certain risk factors, known or suspected, associated with it. One of the best known examples of a cancer cluster emerged in the 1960s, when doctors reported many cases of mesothelioma, a rare cancer of the lining of the chest and abdomen. Researchers found exposure to asbestos the likely shared risk factor. A cancer cluster may first come to light when citizens report that several relatives, friends, neighbors or co-workers were diagnosed with the same or related cancers. Epidemiologists look especially for a large number of cases of one type of cancer, rather than several different types, or numbers of an otherwise rare type of cancer, or a higher than expected number of cases in an age group not usually hit by that type. In Sierra Vista, Ariz., population 40,000, the CDC launched an investigation in 2004 after 12 children were diagnosed with leukemia — three times the statistically probable number. Residents raised questions about the nearby location of two military bases and a jet fuel pipeline that ran beneath the town. In Fallon, Nev., 16 children were diagnosed with leukemia between 1997 and 2003. The CDC said it could find no links between the illnesses and environmental contaminants. Landfills, arsenic, lead or mercury? Residents of Lassen County, Calif., have raised concerns about open burning and detonations at a downwind ammunition depot. People in Daly City, Calif., have wondered whether soil contaminated by toxins was responsible for a rash of genetic defects and illnesses. In Connecticut, researchers looked at concerns about a middle school built over a former landfill, and a high number of diagnosed brain cancers among employees of a jet-engine manufacturing company. In Florida, arsenic, lead, mercury and other substances from contaminated Superfund sites have been fingered as suspects in high rates of cancer, birth defects and babies with low birth rates. In Massachusetts, the suspected culprit for a cluster of Lou Gehrig’s disease and multiple sclerosis is toxic waste from local industries and agricultural pesticides and herbicides. As part of the national “war on cancer” begun in the 1970s, health agencies in each state were directed to compile information about cancer rates and study patterns and trends. In North Dakota, such “cancer tracking” is done by a cancer registry office within the state Department of Health. In recent years, citizens have brought a number of concerns to the office, “but nothing has panned out,” said Marlys Knell, the registry’s director. The registry office and others in the health department have looked at Grand Forks County data from 1997 to 2006 and have found “nothing of concern” regarding cancer rates. They say they will examine cancer incidence and mortality data for 2007 as soon as it is available. Reach Haga at (701) 780-1102; (800) 477-6572, ext. 102; or send e-mail to chaga@gfherald.com.